Australia Day 2017 Kicks Offs Lunar New Year Celebrations Across the Nation. Australia’s Chinese Community is bracing for a double celebration this week with Australia Day on January 26 just one day ahead of the start of Chinese New Year. In Sydney’s Hurstville, located 16 kilometres south-west of Sydney’s CBD, preparations for both are in full swing. 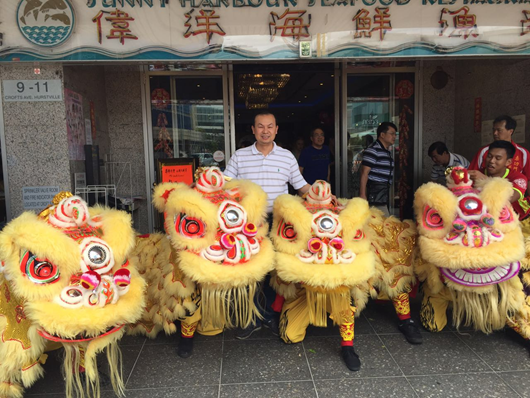 With more than half of Hurstville’s residents having Chinese ancestry, sharing both Chinese and Australian rituals is proving to be busy work. Local Restauranteur Sunny Cheng, who emigrated from China almost 30 years ago reports his Australia Day bookings are at capacity. This sentiment will be echoed in part, across the nation at family BBQ’s, picnics or meals at restaurants like Sunny’s. However, as with the wider Australian population, not everyone in the ever growing Chinese community agrees with the notion of celebrating the day. According to clinical psychologist Elisabeth Shaw from Relationships Australia NSW, “These debates around Australia Day are not necessarily a bad or wrong thing. The differences create a discomfort which is normal within a multicultural society especially where different generations will have different views. As long as there is good intention and not any harm then I think it shows all the healthy signs of a mature community,” she said. Overseas born Aussies are now at their highest number in over a century, making up twenty eight percent of the overall population - and those born in China have doubled in the past decade. “Australia Day and Chinese New Year falling consecutively offers everyone the opportunity to acknowledge both in a significant way, irrespective of which side of the debate they sit,” Ms Shaw stated. In fact in Sydney’s CBD, the merging of Aussie and Chinese rituals will be on display with the iconic Sydney Rooster’s Rugby League team participating in Chinese New Year Celebrations, which in 2017 is the year of the Rooster. “The Roosters will have a presence at the Lunar Markets this Friday evening, with two of our players in attendance to help with the giveaways we will have on offer on the night,” a Sydney Roosters spokesperson announced this week. The festival, which started in Chinatown 21 years ago is expecting over a million visitors, proving its popularity in a city where Chinese culture is now as much part of the city scape as Christmas and Easter celebrations. “It will be a time for celebration and reflection within the Chinese Community and emotions usually reflect this during the Lunar New Year, especially with many families separated from their larger family who are still in Mainland China.” Ms Shaw added. Relationships Australia offer services around the country that include counselling, mediation and a range of family and community support and group programs.